Gray is my second child. He was born without incident on February 27, 2006. He had a pretty regular babyhood. I will admit, there was one time, when he was 9 or 10 months old that I had trouble getting him to look at me. I remember having a quick panic and getting really animated to make him smile. It worked and I didn’t think about it again until his birthday party. 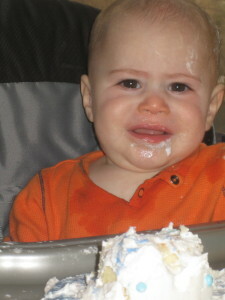 At his birthday party, things were going about as anyone would expect until it was time to help Gray blow out the candle on his smash cake. 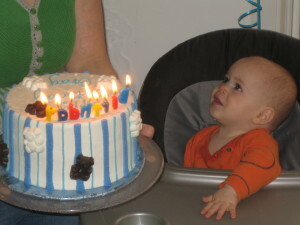 He was very excited when everyone stopped to sing to him in his highchair, but when the smash cake arrived in front of him with that lit candle, he started getting very upset. 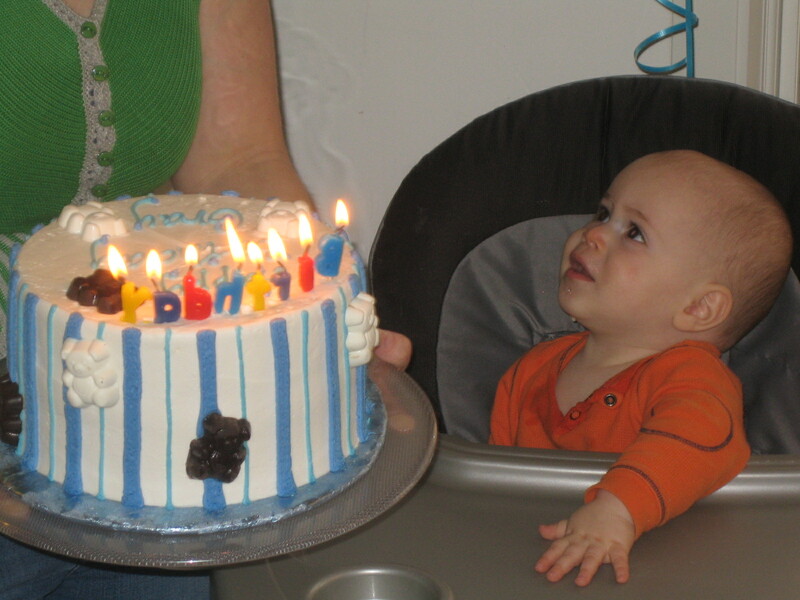 After I helped him blow out the candle, he really didn’t want to have anything to do with that cake. I took his hand and swiped it across the icing. My older daughter didn’t need this cue at her first birthday, but I figured, once it was on his hands, he would figure out how delicious it was and dig in. Boy, was I wrong. He frantically wiped his hand on the tray to get the icing off his fingers. 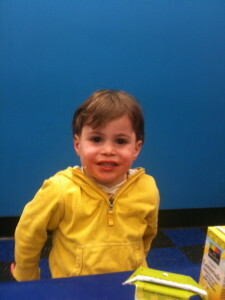 When I dipped my own finger in the cake and put a little piece in his mouth, he completely melted down. It was an uncomfortable scene for everyone there. As I scooped him up and took him to the bathroom to get cleaned up, I knew something was wrong. Really wrong. What followed was a few months of therapy and doctors appointments and tests to determine why he wouldn’t progress to eating toddler foods, why he wasn’t imitating any words, why he loved loud music and rough textures against his skin and mouth. By the time we made it to the developmental pediatrician’s office, Gray was 19 months old and I knew: he had autism. Because of my therapy background, I was quick to connect with friends to get recommendations for the best therapists in the city. Gray was in a structured program by the time he was 20 months and had about 15 hours of therapy a week before his second birthday. It was painful, but I told myself that it would be worth it because the early intervention would fix him up and we would be in a mainstream classroom by kindergarten. His fourth birthday was probably my hardest. I think that was the one that made me realize that a mainstream classroom was likely never in Gray’s future. Leading up to each birthday, sweet Zoe asked me if this might be the year that Baby Gray learned to speak. 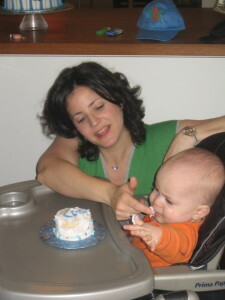 Each year, I would answer her with a “maybe, we hope so.” But by the age of 4, his speech was so non-functional, limited and unintelligible, I knew that his case was really severe. That was tough. At that point, Zoe was 6, Gray was 4 and Lena was almost 1. I knew it was time to quit my job that I loved so dearly and devote my time and energy to my family. I had spent so many years taking care of others with severe disabilities, now it was time to take care of this one special patient and his amazing sisters. I pledged to spend my time searching out the best and most innovative approaches to help Gray. I pledged to give his sisters the attention that they deserved so that the strange behavior in our house would not scar them too badly. I pledged to be a good wife and mother so that our family would feel as normal and cohesive as possible. My first priority was to dive back into Gray’s therapies and evaluate what he was doing in each one. I spent more time discussing goals with the therapists. I took less time getting “homework” like picture books complete. I considered my own goals for what we needed in our own house and I started working with the therapists to make our goals line up. I also started looking around the city and the nation to see what else might be happening in the autism world to help these kids. I guess this would be the best time to discuss my views on biomedical interventions for autistic kids. Originally, I was firmly against all of the ideas that have been put forth by the DAN! (Defeat Autism Now!) community and the many many spin-offs that would probably be offended for being called a spin-off. Let’s face it. We have a major epidemic on our hands. The rise in autism should be cause of world-wide alarm. The problem is that no one knows what is really causing it and what is really wrong. The problem is that everyones’ autism is so different, there is no way to know how many variations we are dealing with here and how to get to the bottom of each person’s disability. I suspect that, in 100 years, people will look back on this medical mystery and shake their heads at how dumb we all were. The answer will seem as clear as thalidomide babies and fetal alcohol syndrome and asbestos poisoning. But we aren’t there yet. And anyone who tells you that they have the answer is either delusional or trying to take your money. BUT…as the mother of a very severely autistic child, it is hard to resist the temptation of medical interventions and theories that might help your child lead a more normal life. I know that I speak for all special needs moms when I say that I would give anything, go anywhere, and pay whatever to give him (and our family) a shot at a happier existence. I have dabbled in the tests and diets, and maybe I will speak more to that point in another entry, but, as of now, nothing biomedical has shown any promise for Gray. Around the time that I reinvigorated my resolve to find the best therapies for Gray, the iPad was invented. One day, while searching the internet for autism therapies in Dallas, I found a website for a clinic that was offering iPad training. That caught my eye. The device was obviously super-cool and Gray liked looking at pictures on my iPhone, so I called to find out more. I learned that there was an app (Proloquo2go) that turned the iPad into an assistive communication device. I made an appointment to visit with the therapist who was training kids so that I could see how it worked and decide if it might be worth a try. In Gray’s speech and behavior therapies, we had been making a big effort to start using a picture communication system. It seemed like a good idea because he liked pictures and we needed to have SOME way to communicate. The problem was that he was so distracted by the physical properties of the picture, he couldn’t attend to the photo on the page. As soon as he saw a picture, he wanted to flip it, flick it, bend it, and put it in his mouth. The effort it took to make him just LOOK at the picture was exhausting. That is why the iPad intrigued me: lots of pictures, but no paper to manipulate. Fast forward (really, fast…because it took him almost 6 months to really understand and functionally use this thing) to his current abilities to functionally communicate his needs and wants with anyone around him, and I marvel at the first thing that really began to unlock the world for my precious boy. It seemed like a crazy idea when I decided to enroll Gray in iPad therapy and spend $1000 on his device and the Proloquo app. But this was a kind of crazy that I could believe in. And it has paid off in spades. The dog was my next big leap. Instead of a $1000 cost for the iPad, this was a $13,500 cost for a highly trained dog. I don’t know what to say except, I had to follow my gut. The more I learned about this (relatively) new kind of service dog, the more I felt it would change our lives for the better. I am eternally grateful that we have enough money and the support system of friends and family. 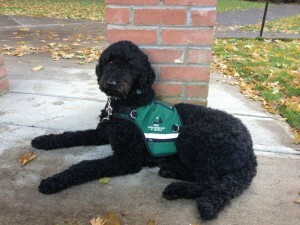 Raising the vast sum to pay for the service dog took about 6 weeks. I know that we are lucky to have the resources that we do and my heart goes out to the people who have financial struggles on top of the crushing blow of autism. If this dog thing works out as well as I hope it does, I promise I will devote my efforts to fundraising for people who cannot access that kind of dog-money so easily. I’m finally on the plane. After a 15 month wait, I’m going to get Gray’s dog. What lies ahead is a leap of faith for me. As I write this now, I am sitting on a plane to Portland where I will meet our sweet miracle dog in about 12 hours. I still have no proof that this will work out the way I hope, but I have faith. What is it I am expecting? I’m not totally sure. Magic? We have a simple list of things that are required to make our lives livable. 1. Gray needs to be potty trained. We are on our way, but after 3.5 years of working on this skill ever so diligently, we are still not quite there. 2. Gray needs to stop disrupting our family with his tantrums and hyper-manic episodes. It makes him miserable and it makes everyone around him miserable. 3. We need to be able to go out in public as a family without the fear of Gray running away into a dangerous situation. He has bolted away from us in parking lots, playgrounds that are close to busy streets, and even our own home is not a place that we can be sure he will stay put. We deserve to go visit friends or walk around the mall or check out a street festival like other families do. Up until now, I have had to resolve myself to leaving him with a babysitter or therapist whenever we want to do family things with the girls. If we want to eat with him in a restaurant, it needs to be somewhere with a booth where I can corner him in or a table that is backed into a wall so that Barry and I can keep him corralled close by. This restaurant better have french fries immediately available and I generally have to apologize to at least a dozen people about Gray interrupting their meal with his bouncing, running around, stealing food off their plates, or general loud squeals and possible tantrums. It is not pleasant. If we want to visit a friend’s house for a barbecue or a birthday party, I have to make sure that the house will have all the doors locked and all the gates are secure and I will spend the entire time following Gray around making sure that he doesn’t escape the premises, or destroy someones belongings or strip naked and poop in some corner. Obviously, there are only a very few very close friends who are willing to invite Gray into their homes. If we want to go out anywhere that is truly public (farmers market, walk in the neighborhood, trick-or-treating, or the mall), an adult must be assigned to pay attention solely to Gray. He will hold your hand for a while, but after about 15-20 minutes, he tires of that and wants to run around without regard for his own safety and proximity to the family. Within 30-40 minutes a meltdown is almost guaranteed because he will not want this adult grabbing at him every 2 seconds to keep him with the group. Now that he is really too big for a stroller, we don’t go to those places with him anymore. Tether training happens when Gray wears a belt with a tether that secures him to his dog’s vest. The adult who is supervising Gray will then hold the dog’s leash and away they go into the community. The idea is that Gray will become accustomed to having the dog by his side. After a short training period, he will learn to ignore the tether that is attached to him and just follow the lead of the dog. Since the dog is able to follow commands and stay with her pack, Gray will learn to come along. The tether will serve as his cue to stop or go as his dog does. This should serve him both in open environments where he is expected to walk with the group as well as in seated environments where it is not appropriate to get up and wander around. Additionally, Gray and his dog should grow a bond. She will sense when he is getting upset and perhaps help him to calm down more quickly. Perhaps her calm energy will influence his. Perhaps the sensory input he gets from stroking and rubbing her will reduce his need to stroke and pinch other people. Finally, perhaps our family can stop having to apologize so much to everyone around us. Gray looks pretty normal until he starts squealing and screaming and throwing shoes at people and pulling hair. It is never a fun moment when you have to explain to a stranger that your son (brother, grandchild) is autistic and therefore acting strange for a reason. Perhaps the dog will just make that announcement for us. When we walk in somewhere with a dog in a vest, people will notice, right? They will give us some extra latitude. And, perhaps, with the dog, Gray won’t need so much latitude anymore. If this works, life is about to get REALLY good. I believe the sensory integration issues revolve around the use of pitocin (sp?) during the labor and delivery process. Every person I have come across whose child has SI issues (including my own) had pitocin. Now there is no way to properly study this as a clinical trial, because who would volunteer to take a medication that could give their child problems? So anecdotal evidence is all we have. Interesting idea. Ironically, my labor with Zoe was the only one where I received pitocin. Gray’s labor was perfectly normal with no induction of any kind. Sensory issues are universal among kids with autism. Everything is either too much or too little for them. I wonder if the pitocin theory applies more to kids who are not on the spectrum, but just have some sensory processing difficulties? Thanks! I’m so happy you like the site. What an amazing story! I know Renee Morlan and she posted your family’s story to Facebook. I have an autistic son who is high functioning and integrated in 2nd grade with “typical” kiddos. But we have had episodes over the years of tantrums, erratic behavior and confusion with the world. I am so inspired and amazed by mother’s like you who keep looking to find the best option for their child. Our son, William, loves animals and younger children for their unconditional acceptance of him and his “quiet” ways. I look forward to hearing more about your journey as our son is 8 and was not potty trained until 5 and 1/2. Anything is possible and I am sure that Hope will make an amazing difference in your family’s life. Thank you, Michelle. I am so happy to hear about kids like your son. They each will leave a mark on the world in their own quiet ways, right? Hey Rhoni. SO glad you are sharing your journey with so many people. Getting out there and educating is terrifying, but so dern needful. I have never seen one of these dogs in action- actually had no idea they existed. My little guy is on the spectrum- our experiences have been different from yours, but reading Gray’s backstory triggers lots of familiar feelings… Coop is 7 now. Your family, by the way is lovely. Rhoni, thank you for sharing. Our stories are all so different and yet in the end we all want the same for our children, a happy life. Our son is 14 and high functioning. He stills has meltdowns and sensory overload is always on our radar. We should be getting our dog late spring from the ASDA it is so helpful to read your story and to have a little more insight to what the process looks like. I look forward to reading more. Thanks, Holly. I wish you all the best with your dog. I know the wait is killing you. It’s worth it, though. You and your family are incredible, Rhoni! You are going to touch so many people through your journey. This is very interesting for me to hear this side of the ASDA story! I have been training service dogs for ASDA for 8 years now, and worked with Hope briefly. I just don’t get to hear much from the families that get the dogs I work with very often, so this is awesome to read! Best of luck to you all! It was such a delight to meet you and Gray & Hope at the park yesterday. Thank you so much for being so sweet and informative to my (very inquisitive) children. We had a fantastic discussion when we left the park. It will be years before we know this for sure, but I’m certain your family, including Hope, left quite the positive impression on my children and really gave them a glimpse into the challenges & successes of autism. I hope your journey continues to be pleasant and peaceful for your family. What a strong and amazing woman you are. This is my first time to get a chance to check out your site since you gave me your card at Disney World almost 2 weeks ago. We met on the tram and I was very inquisitive about your service dog for autism as I have driven autistic children to and from school for approx. 27 yrs. I am so anxious to share this information and your site to my parents and hope to get some fundraisers going for them! Thank you for being so open and sharing of information about this to me.